Both Cal Poly Pomona Parking Regulations and the California Vehicle Code are applicable on the Cal Poly Pomona campus. Cal Poly Pomona is authorized through the California Vehicle Code Section 21113(a) to establish independent parking regulations. All parking regulations are enforced through citations issued by Cal Poly Pomona Parking and Transportation Services. Valid parking permits must be displayed by all vehicles 7 days a week. Under state law, all parking on campuses is subject to the payment of a fee. Authority for parking enforcement is specified in the California Vehicle Code, section 21113(a). All California Vehicle Code sections apply on campus. The Trustees of the California State University are not and shall not be liable under any circumstances for the loss of or damage to vehicle or contents thereof parked or garaged in a lot or structure by fire, theft, or any other cause whatsoever not arising directly from the negligent acts of the Trustees of the University or its employees acting within the scope of their employment. The University reserves the right to restrict the use of any parking space, area, structure, or surface lot at any time and to temporarily or permanently relocate permit holders as necessary. Click to view the Presidential Order: Parking/Traffic Rules and Regulations. Permit must be displayed at all times including during the semester, the summer and breaks. For instructions on the proper way to display your permit, click here. All parking permits are refunded at a prorated schedule, see schedule under our Parking Permit Fees page. Please return the permit to the Police Station, building 109. Students may park in any student parking lot, with the exception of parking lots F-2, P, Q, and the marked areas of lot B, which are reserved for on-campus residential community parking (residence halls and/or suites). In addition, the faculty/staff lots A, F-4, F-8, J-1 & J-2 are also available for student use after 5:30 p.m. during the week and on weekends. All student vehicles must display the Cal Poly hangtag. Parking is enforced seven days a week. Parking Permits are non-transferable. You must affix your University Housing Services (UHS) sticker on your semester decal. These stickers allow you to park in lot F2, lot Q, lot B and P, (marked "Resident Parking"), and for University Housing Services. Parking inside the University Village requires a University Village Sticker displayed on Semester permit. If you are a resident, you are permitted to garage your vehicle in your area of assignment. Changes and restrictions affecting the parking areas can occur at any time due to special events, construction, etc. Restrictions are posted at least 24 hours in advance. You must check your vehicle on a daily basis. Vehicles parked in restricted areas may be cited and/or towed at your expense. Blue Zones: Handicapped (Disabled) parking only and subject to enforcement 24 hours a day. Gray Zones: Medical parking permit required. Red Zones: No parking anytime. Orange Zones: Reserved for service vehicles only. Green Zones: Thirty minute parking only. Yellow Zones: Reserved for active loading/unloading of commercial vehicles and instructional materials by faculty and staff. Spaces that are posted as a restricted or reserved space. Aisles and areas not specifically marked as parking spaces. Affixed to the inside left from windshield with date visible from outside. Placed on the driver's side of dash with date side facing up. If using a car cover or motorcycle cover, provision must be made so that the parking permit is visible. Failure to have a permit visible may result in a parking citation. Two wheel vehicles including mopeds or any motorized bicycles requiring a license by the State of California Department of Motor Vehicles are charged $92.00 per semester for parking permits and required to park in designated motorcycle spaces. Permit is to be displayed on the rear fender or on the front fork. (Please note that parking rates are subject to change at any time with or without notice). For electric vehicles, Lot H provides charging stations for up to 4 hours maximum. All vehicles must display a valid parking permit and are permitted to park in the lot one time per day. In the event a permit has been forgotten, once per semester a temporary permit may be obtained by presenting your Bronco ID Card to Parking and Transportation Services one time per semester. Parking permits that have been lost or stolen may be replaced by Parking and Transportation Services subject to the following conditions: 1) Only one permit will be provided at no cost. Future replacements will be subject to appropriate fees as detailed in the parking rate schedule; 2) Proof of purchase of the original permit must be established; 3) a parking permit replacement application must be completed; 4) Display of a lost or stolen permit is subject to citation, please see the citation schedule for current fees. Faculty and Staff (Represented and non-represented) are eligible to purchase an annual or semester Faculty/Staff parking permit. Employees may park in faculty/staff lots, student parking lots, and resident lots. Visitors may park in the designated Reserved Stalls located in Lot F8 or any student parking lot, with the exception of parking lots F-2, H (if plugged into an electric vehicle charging station), Q, P, and the marked areas of lot B, which are reserved for on-campus residential community parking (residence halls and/or suites). In addition, the faculty/staff lots A, F4, F8, and J-1 & J-2 are also available for visitor use after 5:30 p.m.
Daily Visitor parking permit cost is $8.00 Monday-Friday & $5.00 Saturday and Sunday. You must purchase a parking permit from either the Parking Information Booth located on Oak Lane next to Building 109 or from one of the many self-serve pay stations located throughout campus. 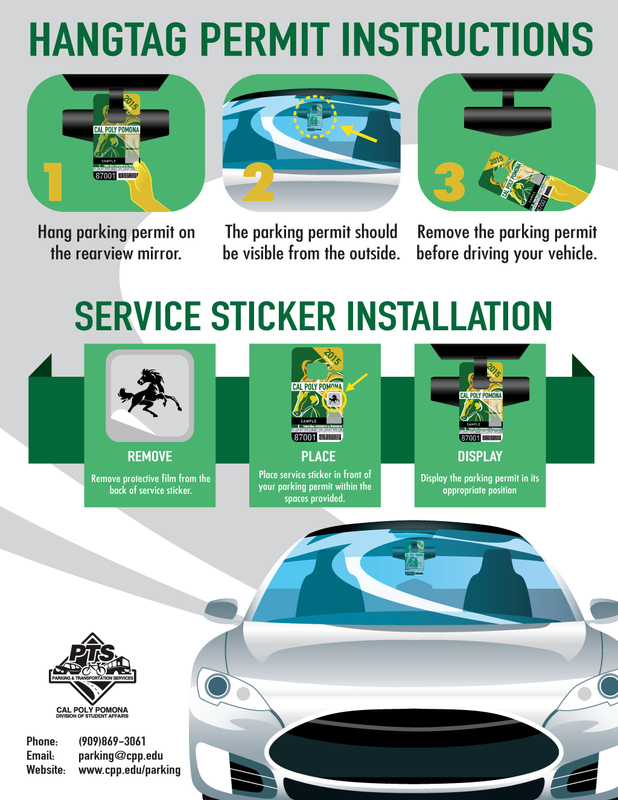 All visitors who park a vehicle on the campus at Cal Poly Pomona must purchase and display a permit. (Please note that parking rates are subject to change at any time with or without notice). A Faculty/Staff: 7:00 a.m. - 5:30 p.m.
Student and Visitor: After 5:30 p.m.
B Student Visitor Parking, and Resident Parking. Designated accessible parking for Kellogg Gym. E1 & E2 Faculty/Staff: 7:00 a.m. - 5:30 p.m.
F-4 & F-8 Faculty/Staff: 7:00 a.m. - 5:30 p.m.
J-1 & J-2 Faculty/Staff: 7:00 a.m. - 5:30 p.m.
Yellow Zones Active Loading/Unloading of commercial vehicles and instructional materials by faculty/staff. Your medical permit is valid in various, designated medical spaces throughout the Cal Poly Pomona campus. For the convenience of the temporarily disabled, courtesy medical parking permits may be obtained from Parking and Transportation Services. A statement from the Health Center or a personal physician must be specific as to the need for preferred parking, the anticipated recovery date, and your name. Medical permits are issued for a maximum time period of six months (one initial and one renewal). In order to obtain a medical permit, a valid semester or annual permit must be presented at the parking office in building 109. All Vehicles, including those with a disabled placard or plate, must display a valid parking permit. Your valid parking permit, when displayed with your valid license plate or DMV disabled placard is valid in all locations authorized by the Department of Motor Vehicles including accessible and/or medical spaces. Disabled placards are NOT VALID in red, orange, or yellow zones. Please refer to your placard/license plate registration for additional information. Lot B is the accessible parking lot for Kellogg Gym. Under the authority delegated to Parking and Transportation Services by the President, no individual or department other than Parking and Transportation Services may grant parking privileges on campus. All parking permits and access cards issued to users of the parking system remain the property of the University. Every vehicle, including those with specialized license plates, not otherwise exempt, which occupies a non-metered parking space designed for an automobile must display a valid permit. Commercially licensed vehicles are not required to display parking permits when engaged in the act of loading and unloading within a designated loading zone but cannot park in a loading zone for more than 15minutes. Parking permits are the property of the University, are non-transferable (for use by the registered permit holder only) and may not be resold. Violations of these regulations will result in possible legal and/or disciplinary action and restitution as applicable. Please park in marked stalls between the lines. Requests must be made 72 hours working-days in advance, before 4:00 PM. Failure to meet the timeline may result in denial of request. If same day request, subject to charge Please submit requests through our online form. PTS may request official documentation showing that Reserved Parking qualifications are met. Please be prepared to show written proof that campus guest is eligible under the criteria listed. Refuse issuance of a parking permit. Change parking assignments or privileges as deemed necessary. Restrict the use of any parking stall, area, structure, or surface lot at any time, and to temporarily or permanently relocate permit holders as necessary. Tow any vehicle which blocks any parking stall, area, structure, lot, and/or driveway, or displays an altered or fictitious permit. The time and date are current or have not expired. Used by an individual authorized by Parking and Transportation Services. All portions of it are clearly and completely visible and legible. It has not been altered, duplicated, cancelled, been reported stolen and lost. It is used to park only in areas authorized by Parking and Transportation Services. When any vehicle is found and it is known to have been issued five or more notices of parking violation, to which the owner or person in control of the vehicle has not responded within 21 calendar days of citation issuance or 14 calendar days of the mailing notice, the vehicle may be impounded until that person furnishes to the impounding law enforcement agency evidence of their identity, an address within this state at which they can be located, and satisfactory evidence that the bail has been deposited for all notices of parking violations for the vehicle. This vehicle code section applies to all streets, parking lots and structures on the Cal Poly Pomona campus. (Vehicle Code 22651) Vehicle owner is liable for towing, storage, and release fees. Storage Impound hearings are provided by Parking and Transportation pursuant to CVC 22852. The purpose of the hearing is only to determine if the officer had lawful authority to store or impound the vehicle. This does not apply to abandoned vehicles removed pursuant to Section 22669 that are determined by the public agency to have an estimated value of five hundred dollars ($500) or less. Post storage hearings are conducted within 48 hours of the request, excluding weekends and holidays. Per California Vehicle Code section 22852(a), a post storage hearing may be requested by the vehicle’s registered or legal owners or their agents to determine the validity of the storage or impound within ten (10) days of the date of the impound. Violation of parking regulations subject an individual to disciplinary and legal action, including but not limited to repossession of parking permit, imposing fines, withholding of refunds, and revocation of parking privileges. Student disciplinary cases may be referred to Judicial Affairs and employees to the appropriate Department Chairperson or Administrative Officer. Permits are non transferable in any manner. Resale is prohibited and will subject both buyer and seller to disciplinary action. An unauthorized use of a parking permit by an individual not registered with the Cashier’s Office and Parking and Transportation Services may result in cancellation of parking privileges. Falsification of information on parking applications may result in the recall or cancellation of a parking permit, and may also subject the individual to disciplinary action. Possession and/or use of a lost, stolen, duplicated or voided parking permit, and counterfeiting, duplicating, or altering of a permit is cause for restitution, disciplinary, and legal action.